Los Angeles, CA—Getting to see a film at the Darrell Zanuck Theater on the Fox lot has always been a treat. Tonight it was Exodus: Gods and Kings starring Christen Bale and Joel Edgerton. Ridley Scott directed this film. It happened to be in 3D but this was not our father’s 3-D. It was amazing to say the least. The other production surprise was a generous use of camera drones. They smoothly hovered and passed over the actors at low altitudes. The story was an old one. 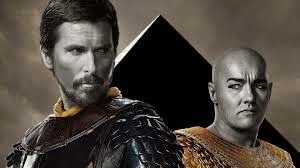 It’s an updated Ten Commandments with Christen Bale as Moses and Joel Edgerton as Pharaoh Ramses. These are journeyman actors that gave great performances. The special effects were epic and very believable. Fox security workers were out in force and armed with night vision equipment diligently looking for anyone trying to capture video or audio with any devices. Unfortunately the camera ban prevented me getting selfie shots with the actors Christen Bale and Joel Edgerton. The film is definitely good for the family. It opens in theaters on December 12th.